← Muslims have been welcomed into our British society but we don’t want to see the ‘burka’ or ‘niqab’ here thanks – BAN THOSE NOW? 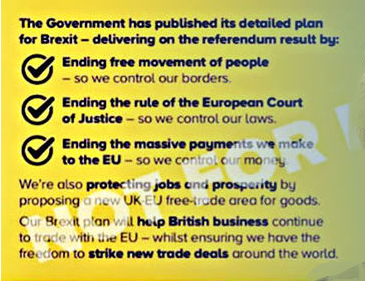 The powers that be and the Establishment in the UK were flummoxed when the people voted in June 2016 to openly defied them in favour of BREXIT. However, when they had overcome their bewilderment, they simply concluded that with time, because they knew best [mainly for themselves, their class, and their commercial interests), that they would simply overturn that ‘silly & ill-informed’ decision by morons, when sufficient water had flowed under the bridge (just as many of us predicted at the time) – so after 2 years that point has been well and truly reached now, hasn’t it? Yep, the vision has been abandoned, the UK’s negotiating position undermined, returning control of our laws in any real sense certainly not enacted, and a mockery made of politicians’ BREXIT promises to deliver on the mandate of the referendum result, as well as reneging on the Tory manifesto commitment to leave the EU customs and single markets. We will forever now be rule-takers, accepters without any say of the EU’s rulebooks, and with disputes ultimately adjudicated by the ECJ (European court of justice.) – DOES THAT SOUND LIKE ‘BREXIT’ TO ANYONE, eh? Oh yes, because of these current unwarranted events, 2 senior Ministers, who indeed were most behind the population’s BREXIT Referendum vote, have duly resigned (Boris Johnson Foreign Secretary, & David Davis BREXIT Secretary), but hardly with much honour as they have singularly failed to halt Remainer PM Theresa May in her tracks, haven’t they? But then there are other major Leave players who with unprecedented astounding dishonour, have chained themselves to their Cabinets desks (Michael Gove Environment Secretary & Andrea Leadsom Leader of the House, just to mention two). Most people will know that the EU [well Germany and France anyway] are also desperate to avoid a NO-DEAL scenario [though not as desperate as the UK’s traitorous betrayal Remainers, eh? ], so they are likely to offer a late ‘fudge-style’ Deal that would allow PM Theresa May to save face on her (abandoned) red lines – it would mean postponing key decisions, and with the UK still legally leaving the EU on schedule, whilst deferring many of the major issues for further negotiation during the 21-month so-called ‘transition period’ [even prominent Remainers are aghast at that prospect]. That will be justified on the basis that there is now insufficient time available to negotiate all details of the UK’s future relationship with the EU [and Michel Barnier WILL blame solely the UK for that and not Brussels bureaucrats’ intransigence, won’t he?]. The other side of the coin comes with a report from a former Harvard economist and entrepreneur, that countries which do NOT have a trade deal with the EU and rely on WTO rules, strongly outperform their rivals – the implication being that a true BREXIT would turn Britain into an economic powerhouse, no less? Exports by the UK to 111 countries outside the EU under WTO rules grew by 2.9% in the 22 years prior to 2016 – more than 3-times greater than the 0.9 percent growth in exports to EU countries and 1% higher than trade with the 62 countries which have trade agreements with the EU, which demonstrates just that, doesn’t it? [Assessments made by the Treasury on a so called NO DEAL, suggesting it was the worst option, have been branded as “dishonest, incompetent and shamelessly partisan”]. Now, that is why many of us have said from the outset, that Britain will thrive long-term [that is something the EU bureaucrats are horrified by), so NO-DEAL is by far the BEST and ONLY outcome we should be seeking in Brussels. Not only would the UK not be bound by EU rules nor committed to agree to its red tape and regulations, but we would be able to strike other lucrative free trade deals around the world, as well as the UK Treasury collecting £80 billion a year in extra revenue, and that in addition to saving £40 billion in ongoing EU fees – all that’s not chicken-feed, is it? Any BREXIT deal will face a parliament in which the majority were Remainers, so might still have had hopes either for the softest BREXIT possible or no BREXIT at all, but many are increasingly scared now of voter retribution if that indeed results – so what happens if the Conservative plan collapses, the Government is unable to get through the House of Commons whatever deal it might negotiate with the EU (if it actually manages to negotiate one at all)? NOBODY KNOWS, do they? Meanwhile, Project Fear has returned and is again running at full-tilt, with predictions that includes dire consequences, a national crisis, chaos on all fronts, an economic shock of seismic proportions, capital fleeing the City, a run on the pound, ports & airports gridlocked, shortfall of critical medicines and the need to stockpile medicines, a food supply crisis akin to WW2, together with major health risks in the offing (including STDs like super gonorrhoea superbug spreading), a shortage of EU skilled workers, – what a load of garbage, eh? This entry was posted in AUSTERITY, benefits, BREXIT, business, children, community, currency, economy, Elections, establishment, EU, EURO, europe, European Union, government, Health, industry, Law, manufacturing, Other Countries, political parties, Politics, stock exchange and tagged Andrea Leadsom, Boris Johnson, BREXIT Secretary, Chequers, conservative, David Davis, Environment Secretary, Foreign Secretary, Leader of the House, Leavers, Michael Gove, Michel Barnier, Olly Robbins, Project Fear, Remainers, Theresa May, tory. Bookmark the permalink.